Welcome to our first newsletter, with news and information from Wentworth Court which we hope will be of interest and provide an insight into life at the home. 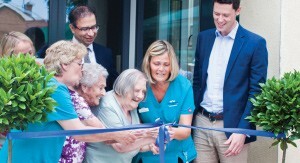 We opened our doors in May of this year as Cheltenham’s first dementia-only nursing home. With a specialist focus, we recruit staff who have experience and an interest in dementia care and invest in our team so that they can engage with best practice and training within the care sector. Our aim is to offer the best possible levels of care so that each resident’s needs are met and they feel valued, respected and treated as an individual. It’s been an exciting few months for us, and we were delighted to welcome Alex Chalk, MP for Cheltenham to our official opening in July. He was impressed with the quality of the accommodation and the specialist focus on dementia care. If you have not visited us yet, we extend a warm welcome for you to come and have a look at what we have to offer and meet our special team here at Wentworth.